If there was a List Olympics, I would be the captain of Team USA. At any given time, I have at least three lists going and those are only the paper ones. On my computer, have lists of ideas for blog posts, topics for essays, and workshops I want to teach. I have lists of books I want to read, movies I want to see and people I want to call (or email, of course, since I am after all on the computer). Recently, I discovered a phone app that allows me to not only create multiple shopping lists (for each of the stores where I shop) but Errand Lists and To Do lists, too. And in a half a second, I can send said lists to my husband Frank’s phone. You best believe that when I came across this modern miracle of list making, I was a quivering mass of planning happiness. Not everybody is a planner like me. You may be a ruminator, a brooder, a chewer-of-things-that-have-happened. Like a kid with an extra-large fireball in her mouth, you may find yourself rolling difficult scenes or conversations around over and over in your mouth even if they burn. Whether ruminator or planner, it was us that my yoga teacher, Sara, was talking to on Saturday morning last winter. As I lay down for the two-minute savasana (Corpse Pose) between the standing and floor series, I was ready to settle into a couple of luxurious minutes of planning exactly every-single-blessed-thing I was going to do that day in my head. As Sara glided gracefully through the room, she invited us to sense our breath, settle our minds, and stay present in this moment. Her words made me laugh at myself. I imagined My Day as an avuncular character ~ a big, leather jacket-wearing, kind but unpredictable guy ~ waiting patiently for me outside the yoga studio. He leaned against the wall, good-naturedly watching me plan everything, letting me think I was in control when he had his own agenda for the day, thankyouverymuch. This summer, when Frank was injured and lots of wretched things kept happening in a dreadful string, my mind was a whirling swirl of terrible imagined future scenarios. In an effort to calm myself, I took to breakfasting on the back porch and writing in my journal everything that I saw or heard. The exercise was a writer’s version of what Sara had asked us to do in yoga. Sometimes I wrote about the color of the sky or the sound of the birds but sometimes, my mind would derail me. Planning is not a bad thing. The subtitle of this blog indicates my sincere belief in setting intentions and directing our energy. It’s when we are attached to the way things turn out and our expectations drive us, that we suffer. Thinking over what has happened isn’t a bad thing, either, as long as we can (as I wrote about last week) do it with honesty and gentleness. Suffering happens when rolling that fireball of regret and self-flagellation in my mouth keep me from being here now. Do what you’re doing. Then do the next thing. 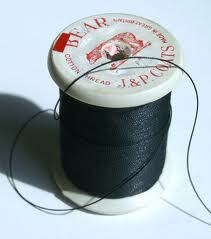 Let yourself follow the thread of the day.